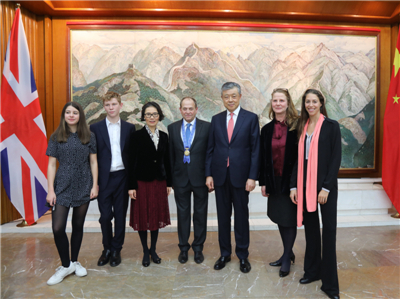 On January 14, Ambassador Liu Xiaoming and Madam Hu Pinghua held a reception at the Chinese Embassy celebrating Stephen Perry, Chairman of the 48 Group Club, being awarded the China Reform and Friendship Medal. Mr. and Mrs. Perry and their children, Sir Douglas Flint CBE, the UK Treasury's Belt and Road envoy, Creon Butler, Director of Cabinet Office, the Rt Hon. Lord Sassoon FCA, Chairman of China-Britain Business Council (CBBC), the Rt Hon. Lord Davidson of Glen Clova, Sir Martin Davidson KCMG, Chairperson of Great Britain China Centre, Sir Gerry Grimstone, Lead Non-Executive Board Member for the MOD, Tom Troubridge, Vice-Chairman of CBBC and Chairman of China Business Group of PwC, David Sayer, Chairman High Growth Markets, KPMG, Sir Sherard Cowper-Coles, Trustee of Asia House, Peter Nolan CBE, Professor of the University of Cambridge, Martin Jacques, Senior fellow at the University of Cambridge, Gideon Rachman, Chief Foreign Affairs Commentator of the Financial Times and nearly 100 people from British political, business, education and media sectors and representatives of Chinese institutions in the UK and overseas Chinese attended the event. 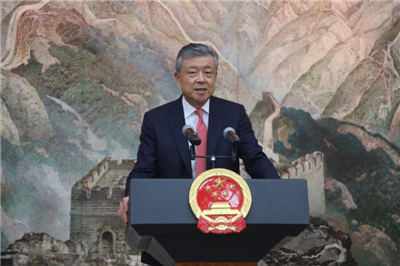 Ambassador Liu Xiaoming delivered a speech at the reception, extending his warmest congratulations to Mr. Perry on his being the only awardee from the UK to receive the China Reform and Friendship Medal. He noted that the 40 years of reform and opening up was a great journey in which China embraced the world with open arms and joined hands with global partners to achieve common development. “In this historical process, friends from all over the world have participated deeply in China's reform and opening up, and played an active role in promoting the exchanges and cooperation between China and the rest of the world. They have all made outstanding contribution to this great cause”, the Ambassador said. Upholding the “Icebreakers” spirit, three generations of the Perry family have been committed to promoting China-UK friendship and cooperation on economy, trade, culture and people-to-people exchanges. The award represents the sincere thanks of the Chinese people to three generations of the Perry family for their support to China’s reform and opening up and the recognition of the progress of the China-UK relations. It embodies the expectation that the people from all walks of life in Britain will take part in China’s new round of reform and opening up. Ambassador Liu pointed out that China-UK “Golden Era” never comes easy and deserves greatest care and attention. From Perry’s award, there are three important things people can learn to ensure a steady and sustained progress in China-UK relations. The first is to break through ideological barriers, engage each other and exchange ideas in order to enhance mutual understanding and promote inclusiveness. The two countries must carry on the “Icebreakers” spirit to break the barriers of ideological mindset, prejudice and misunderstanding to promote deeper mutual trust and closer cooperation between China and the UK. The second is to focus on common interests and achieve win-win results through friendly cooperation. As China and the UK have both come to a crucial stage in their respective development, the two countries should resist all kinds of interruption, actively explore new areas of cooperation for the benefit of both sides, and continuously match their development policies to achieve win-win results. The third is to follow the trend of history and achieve common progress through mutual learning. The two countries should go along with the trend of the times and learn from each other in the spirit of mutual respect and “harmony without uniformity” to build solid public support for China-UK cooperation so as to contribute to the building of a community with a shared future for mankind. 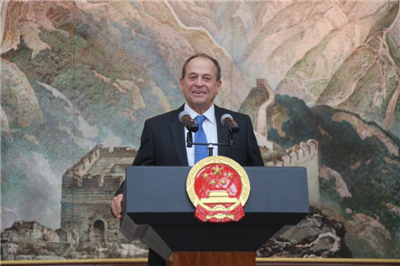 In his speech, Mr. Perry expressed his sincere thanks to the Chinese government for conferring on him the China Reform and Friendship Medal and happily shared his memories of the ceremony where he was presented the award, calling it “a breathtaking moment” in his life. He said that China through its industrial revolution to become a major industrial and trading country in the world has achieved in 40 years what most countries took 200 years to achieve. The Socialism with Chinese Characteristics, the Belt and Road Initiative and a community with a shared future for mankind are three driving forces for China’s future development. He was convinced that under the leadership of President Xi Jinping, China will be more prosperous in the following 40 years. At the current crossroads in the civilization of mankind, understanding China’s viewpoints is very important to the future development of the UK. China and the UK should give full play to the historical opportunities brought by their own development and the Belt and Road Initiative to enhance cooperation so as to achieve win-win results. 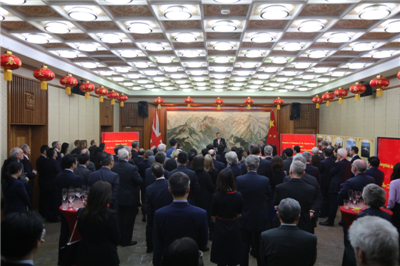 At the reception, a photo exhibition focusing on China’s Reform and Opening up was held and a video showing Perry being presented the Medal by Chinese leaders and summarizing his contribution to China’s reform and opening up was played. The guests were impressed by China’s remarkable achievements after 40 years of reform and opening up and regarded the reception as both meaningful and touching, showing that China will never forget its past or its old friends. People from both countries should work together to promote a steady China-UK “Golden Era” so as to deliver more benefits to both countries and people, and make greater contribution to building a community with a shared future for mankind.